Now in its sixth year, the 2018 “Marketing Management Book of the Year” is more than 300 pages covering the hot topics and issues of marketing, media and advertising. It is a must read for any marketer, marketing procurement, marketing technology and advertising agency grappling with the fast-paced environment of today’s marketing. This edition is proof the issues of marketing management continue to grow in popularity and prominence amongst the marketing, procurement and the advertising industry. Covering a wide range of hot marketing topics from: media transparency, marketing and creative technology, data analytics and digital marketing to advertising roster management, marketing procurement, optimised production and everything in between. All the contributors, from within TrinityP3’s consulting team and guest contributors are subject matter experts with at least 10 years hands on industry experience, giving practical insight into the complex world of marketing, media and advertising management. When we are all so short on time but need to ensure we keep pace with the change that is going to be more than a series of latest buzz words, Darren is elegantly able to distil some of the core topics that real matter, answers some of the pressing questions – but importantly encourages us all to ask the next question. In a world full of noise, Darren sets himself apart with his authentic, human and resilient approach – all the attributes of a great brand. He has a keen understanding of the balance between organisational effectiveness, brand building and creating genuine connection with customers. He recognises the beauty and longevity of a brand, while setting realistic expectations that brands must also deliver ROI in the short term. While others are chasing headlines, Darren is chasing tangible, measurable outcomes that ensure the end customer/consumer connects with the true purpose of a brand. Darren is relentless in continuing to challenge us all – marketers and businesses alike to think differently and never become complacent. Darren can always be relied upon to say it how it is, in an industry that rarely does. And he’s not afraid to question the common marketing rhetoric, if it’s not common sense. Like when everyone is obsessing about digital transformation, he turns digital posts into an analogue book. Darren Woolley was the last face I expected to see nightly in my bed – but the distinctive books with his face on the cover are a great find. The succinct posts are insightful, informative and inspiring. There’s a level of authenticity that makes the book refreshing to read. Essential reading for practically improving your marketing leadership. Finish it quickly to avoid alarming your partner further! Now in its fifth year, the 2017 “Marketing Management Book of the Year” is more than 350 pages covering the hot topics and issues of marketing, media and advertising. It is a must read for any marketer, marketing procurement, marketing technology and advertising agency grappling with the fast-paced environment of today’s marketing. This edition is proof the issues of marketing management continue to grow in popularity and prominence amongst the marketing, procurement and the advertising industry. Covering a wide range of hot marketing topics from: media transparency, marketing technology, data analytics and digital marketing to advertising roster management, marketing procurement, optimised production and everything in between. It takes a village. It seems that almost everything in life does. Darren’s strategic approach in capturing the marketing village speak in Top 50 Marketing Management Posts is what one may call, book brilliance! As busy professionals, you can quickly scan hot topics, gain key insights, and find yourself in a thought provoking, creative space which leaves you with great nuggets to help answer the often pondered question by all at some point, “what next?”. Trinity P3 nailed this one. A must read! Mary Ann Brennan, Senior Director, Global Procurement, Mattel Inc.
Darren brings real insight and great clarity to complex marketing challenges. He has a real empathy for the issues facing clients and agencies and a deep knowledge of brand and technology. The Top 50 Marketing Management Posts are a reflection of this thinking, providing concise, relevant and challenging views on a discipline, which is moving rapidly. 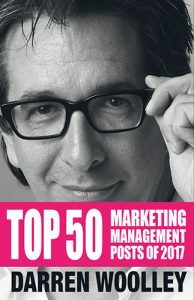 The “Top 50 Marketing Management Post book” has not only become my bible, but also a great reference to share amongst my Procurement Marketing Peers. If you are after a straight to the point, insightful and sometimes though-provocative book, this is the one. These compilations of blog posts are not about theory but, tangible and pragmatic tools/concepts delivered from an objective standpoint. Going from strength to strength, this year’s “Marketing Management Book of the Year” is more than 270 pages covering the hot topics and issues of marketing, media and advertising. It is a must read for any marketer grappling with the fast-paced environment of today’s marketing. This is the fourth year that TrinityP3 has published the Top 50 Marketing Management Posts and 2016 is proof the issues of marketing management continue to grow in popularity and prominence amongst the marketing, procurement and the advertising industry. Covering a wide range of hot marketing topics from media transparency and digital marketing to advertising roster management, marketing procurement, optimised production and everything in between. industry perspective comes from a deep understanding of the needs of both advertisers and agencies. It is rare to get such an insightful holistic perspective on the issues and opportunities that shape today’s fast paced marketing industry. This year’s Marketing Management Book of the Year has over 200 pages covering the most popular topics in the category. Including contributions by Debra Giampoli, Global Director of Agency Relationships at Mondelez on the agency selection process, David Little, International Procurement Specialist on Marketing Procurement, Craig Hodges, Founder and CEO of King Content on Content Marketing Effectiveness and ‘The Buyer’ on decision making and procurement. Plus there are a huge range of topics from the TrinityP3 past and present in posts by Darren Woolley, TrinityP3 Founder and Global CEO, Stephen Wright and Stephen Benrad on Media, Anton Buchner on Data and Digital, Nathan Hodges, Georgia Suttie and Anita Zanesco on Pitching and Roster Management and last but not least, Stephan Argent, President of Argedia Group and Marketing FIRST Forum partner providing his views of the issues. Darren Woolley is simply different. He sees things through a different lens – a lens that is reality based – but way beyond conventional wisdom. He is one of the most practical, insightful thought leaders in the marketing community. If you want a different answer, link up with Darren. As such, he is a must read for everything he writes – and especially the “Top 50 Marketing Management Posts of 2014″. Strategic Marketing Management and Marketing Procurement continues to grow in prominence as the challenges of measuring return on marketing investment and the desire to improve marketing efficiency grows across every category and every market. The TrinityP3 blog is evidence of this growth with consistent growth of readers by more than 300% per year each year since 2011. 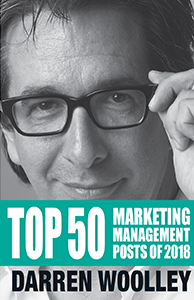 The “Top 50 Marketing Management Posts Of 2013” is 200 pages covering the most popular topics in the category. It includes storytelling, strategy and collaboration from Shawn Callahan (Anecdote), content strategy by Craig Hodges (King Content) and pricing strategies from Jon Manning (Sans Prix, Pricing Prophets), plus marketing perceptions from Jon Bradshaw (Brand Traction) and great insights on innovation, creativity and collaboration from Andrew Armour (Benchstone Limited). Plus there are fabulous insights and stories by TrinityP3’s Founder and Global CEO, Darren Woolley, Nathan Hodges, Nick Hand and Esther Selvanayagam. There is Mike Morgan on SEO, social media planning and content strategy. And Stephan Argent (Argedia Group) a founding member of the Marketing FIRST Forum.